Looking For The Best Melodica For The Money? The melodica goes by many names, including the blow organ, the pianica, the melodyhorn and the key harmonica, but no matter what you call it, the melodic is one of the most harmonic and versatile instruments in the world. Whether you are new to the world of music or an experienced professional, the free-reed instrument known as the melodica is always a good choice. 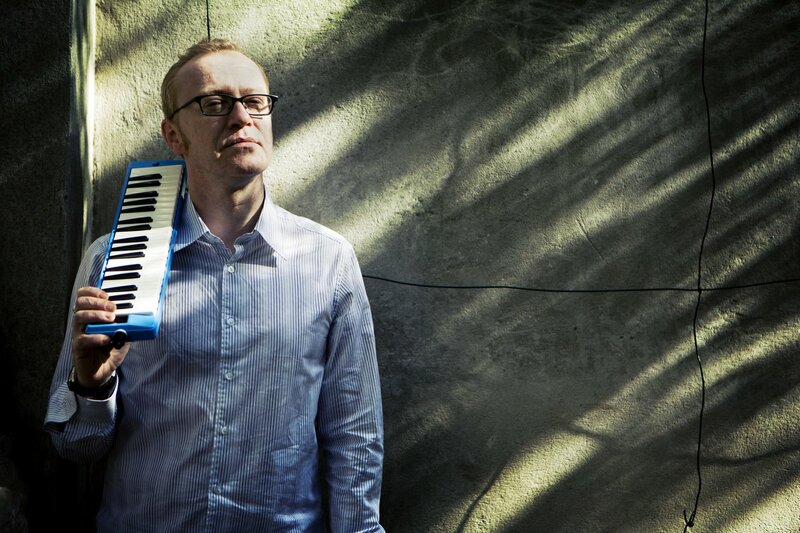 The melodica features a keyboard on top, and musicians play it by blowing air through a mouthpiece. If you are in the market for your first melodica, you need to know what to look for and which features are the most important. An affordable price – Melodica prices run the gamut, from ulta-affordable to ultra-high end. If you are new to the instrument, an affordable starter model is a must. Key size – Look for keys that are amply sized, easy to finger and comfortable to play. Key size is an important consideration, so look for a model that fits your hands and playing style. Build quality – The quality of the build is obviously an important consideration, so look for the best melodica that fits your needs and your budget. A comfortable weight – The weights of melodicas varies quite a bit, so look for an instrument that is comfortable to hold and carry. Blow hole design – The design of the blow hole will affect how comfortable the melodica is to play, so pay careful attention to this key feature. It is important to know what to look for when choosing a melodica, and assessing the five features listed above is a good start. With that in mind, here are five of the best melodicas on the market today. With its stylish red color and impeccable design, the D’Luca M37-RD 37 Key Melodica with Case is one of the best on the market. 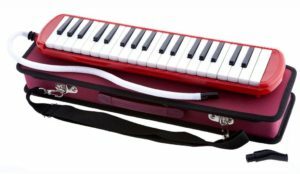 This versatile and easy to play melodica is certainly one of the best reviewed on our list making it clear that current owners appreciate its quality and excellent design. The D’Luca M37-RD 37 Key Melodica with Case comes with a long list of features and benefits, including 37 piano style keys for easy play and excellent comfort, a zippered carrying case for simple and secure transport, a comfortable mouthpiece and a versatile extension hose. 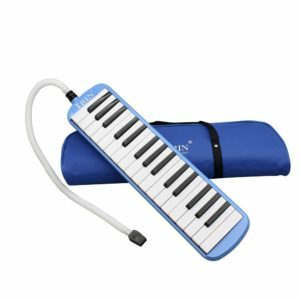 If you are looking for a beginner-friendly melodica to start your playing career, the Andoer 32 Piano Keys Melodica Musical Instrument for Music Lovers Beginners Gift with Carrying Bag would be an excellent choice. The included carrying bag makes it easy to transport the instrument anywhere you go, and the quality construction should provide years of trouble-free play. The Andoer 32 Piano Keys Melodica Musical Instrument for Music Lovers Beginners Gift with Carrying Bag also sports an excellent rating on Amazon.com. It is easy to see why this melodica is so well reviewed, given its extensive list of features, including a beginner-friendly design with 32 piano-style keys, a stylish blue finish and a bendable straw mouthpiece for simple and comfortable play. 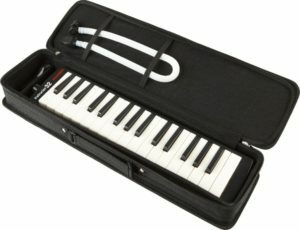 If you are new to the melodica and are looking for a great way to get started, this is the instrument for you. The Hohner 32B Piano-Style Melodica Black is one of the best reviewed on our list, and for good reason. If you are a piano player, you will find the transition to this versatile melodica easier than you ever thought possible, thanks to the piano-style keys and the comfortable design. 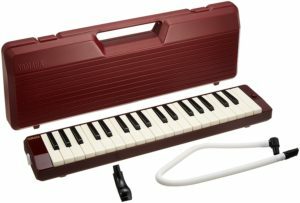 The Hohner 32B Piano-Style Melodica Black comes with a long list of features typically found only on higher priced instruments, making this model a real bargain. When you pick up this great melodica, you can enjoy a range of more than two and a half full octaves, making the instrument perfect for soprano or alto. You will also find 32 piano-style keys, starting with F below middle C.
This range is great for beginners and experienced melodica players alike. 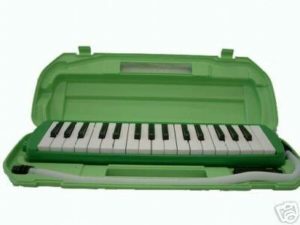 There is even a study carrying case, so you can take the Hohner 32B Piano-Style Melodica with you wherever you go. The 32 Key Melodica is another worthy entry on our list of best instruments due to its high quality and durable design. Perfect for beginners and experienced players alike, the 32 Key Melodica is designed for easy play, with a comfortable layout that makes it simple to learn, even for the true beginner. It is easy to see why so many current owners swear by the 32 Key Melodica and take it with them wherever they play. Whether you are new to the instrument or already an experienced player, you will find a lot to love in its innovative and versatile design. Yamaha is a popular name in the world of musical instruments, and the Yamaha P37D 37-Key Pianica is one of the best instruments on our list. With an innovative yet simple design, this excellent melodica is easy to play, simple to learn and top quality. Despite its ease of play, the Yamaha P37D 37-Key Pianica features a rich resonant sound that even the long-time melodica fan is sure to love. This Yamaha model also comes with a number of high-end features, including a design that produces rich, clear tones, anti-corrosive reeds for long life and true sound and a comfortable playing surface. It is clear the Yamaha P37D 37-Key Pianica has a lot to offer. The melodica is a fun and unique instrument. Whether you are new to the instrument or an experienced player, you will find a lot of great choices on the above list. This list represents some of the best melodicas on the market, so you can choose the one that best meets your needs and budget.